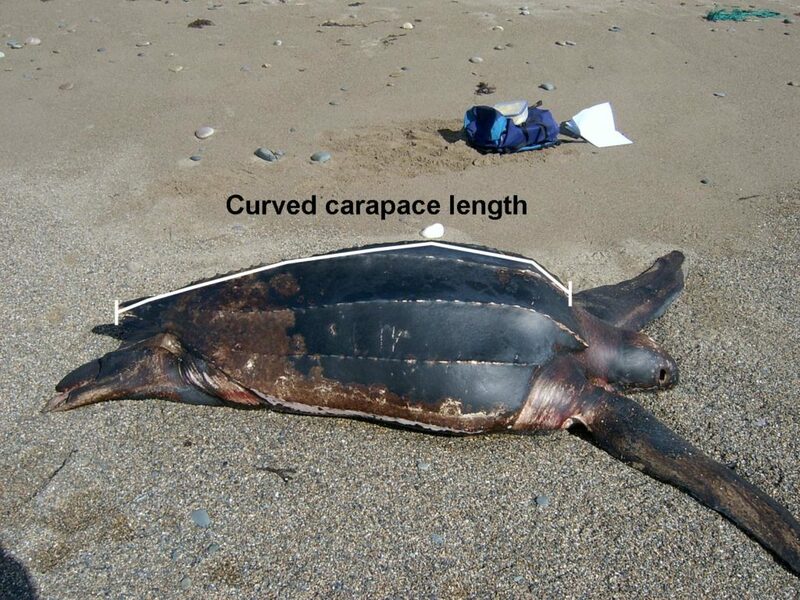 The vast majority (>90%) of turtles sighted swimming in Irish waters will be Leatherback sea turtles. However, if a turtle is found on the shore (i.e. stranded) it may be one of several species, but most likely a Leatherback or Loggerhead. During the summer months, if you find a stranded turtle, it will probably be a Leatherback sea turtle. During the winter months it will probably be a Loggerhead. However, both species can wash up at any time of the year. Size is the best trait to distinguish between them: if very large (close to 1.5 – 2 m long!) it is a Leatherback and if very small (10 cm to <1 m) it is a Loggerhead. On very rare occasions a Hawksbill, Kemp’s Ridley or even a Green turtle can be recorded. These are difficult to distinguish from Loggerheads without proper identification cards and having some previous experience. However, some key characteristics for separating these species out are: count the number of scales just below the eye, count the number of scutes running down the back of the turtle’s shell, and count the number of scales on either side of the underside of the turtle’s shell. For stranded turtles, one of the key metrics that can help researchers both identify and age the animal is the curved carapace length. If possible, please measure this directly and insert the length with your record or place something in the photo to provide a scale and provide the length of the item in the comments section of the record.